South Koreans braved biting cold on Saturday to take to the streets to demand scandal-tainted President Park Geun-hye resign. It was the 12th consecutive Saturday rally, which has been organized over an influence-peddling scandal centered on Park and her long-time friend Choi Soon-sil. 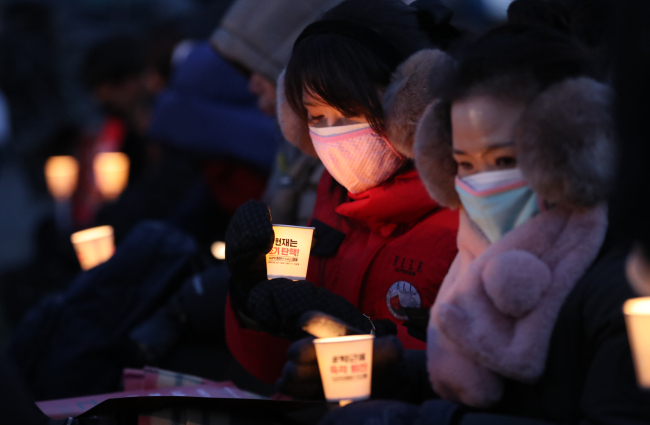 With some 1,500 civic groups involved, the new year's second rally at Seoul's Gwanghwamun Square -- held with the mercury well below zero -- also called for the arrest of corporate leaders who allegedly bribed organizations linked to Choi in exchange for favors from the government. About 14,700 riot police were mobilized to the scene. The organizers said more than 100,000 came out for the rally as of 6:30 p.m. Police announced Friday they would no longer release their own figures because the discrepancy between their numbers and the organizers' estimates had created confusion. Elsewhere in Seoul, a crowd of Park supporters gathered in Hyehwa-dong, an area northeast of Gwanghwamun, demanding Park's impeachment be nullified and the team of special prosecutors investigating the scandal disbanded. These protesters said there were 1.2 million of them on the streets. Following the National Assembly's vote to oust her on Dec. 9, Park was suspended from all powers and Prime Minister Hwang Kyo-ahn took over as acting president.